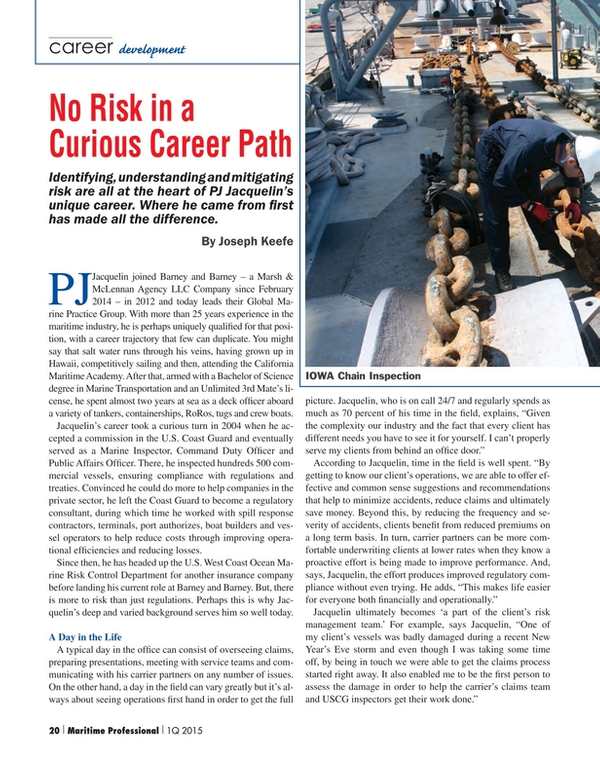 Identifying, understanding and mitigating risk are all at the heart of PJ Jacquelin’s unique career. Where he came from first has made all the difference. PJ Jacquelin joined Barney and Barney – a Marsh & McLennan Agency LLC Company since February 2014 – in 2012 and today leads their Global Marine Practice Group. With more than 25 years experience in the maritime industry, he is perhaps uniquely qualified for that position, with a career trajectory that few can duplicate. You might say that salt water runs through his veins, having grown up in Hawaii, competitively sailing and then, attending the California Maritime Academy. After that, armed with a Bachelor of Science degree in Marine Transportation and an Unlimited 3rd Mate’s license, he spent almost two years at sea as a deck officer aboard a variety of tankers, containerships, RoRos, tugs and crew boats. Jacqueline has literally done it all. This includes time spent in the Coast Guard as a marine inspector, at sea commercially and with MSC PAC, as a marine surveyor, a college professor and now, heavily invested in the insurance side of the game. One aspect of that progression – the decision to join the Coast Guard after having already sailed commercially, is an interesting one. Jacquelin’s decision to join the Coast Guard, influenced in part by the events of 9/11, was also a function of having dealt with the Coast Guard on the mariner side.